Lenora Lumina McFarlane Hoffmann, 92, beloved mother and good friend to many, passed away peacefully on August 1 in Fort Myers, Fl. She was born on October 13, 1925, in Tracy, MN. After completing high school she moved to Walla Walla, WA, to work in a support role for air traffic controllers during World War II. In Walla Walla she met Robert (Bob) McFarlane, whom she married in 1947. They raised 5 children together in Vancouver and Calgary, Canada, and East Grand Forks, Minnesota, while Lenora provided office support for McFarlane Sheet Metal, the business Bob started. They retired to Sanibel, FL in 1980, and Bob passed away in 1989. Lenora married Joseph (Joe) Hoffmann in 1993, and they continued to live on Sanibel and Bemidji, MN, until Joe’s death in 2006. 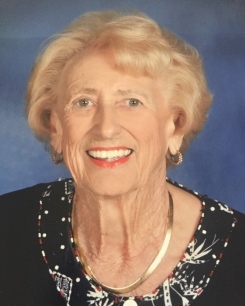 Lenora was particularly known for her love of golf, travel and her significant volunteer efforts throughout her life, serving on various boards and assisting many non-profit organizations. While living on Sanibel she was active at St. Isabel’s catholic church, the Big Arts Theatre and the Chamber of Commerce, to name a few. She considered Sanibel her home, as she lived there longer than any other place and truly loved the area and people. She left Sanibel in 2014 to live at the Cypress Cove Retirement Community in Fort Myers, where she continued serving on various boards. We would like to thank Hope Hospice, Dr. Liu and all the caregivers at Cypress Cove that assisted her during her final months at the Lodge at Cypress Cove. She considered herself very lucky to live at Cypress Cove. Lenora was preceded in death by her two husbands, Robert McFarlane and Joseph Hoffmann, her parents Hector and Isabelle Surprenant, brother Ernest and sister Glenora (Fatt) Fick. Lenora is survived by sons Dave McFarlane (Kathy), Mike McFarlane (Pat), daughters Barb McFarlane (John Pratt), Nancy McFarlane (Steve Stash), Trish Nedberg (Tim), step-son Jeff Hoffmann (Barb), step-daughters Jenni Johnson (Don) and Laurie Wickstrom (Paul). She is survived by 18 grandchildren and 15 great-grandchildren, by her sister Liola Cornelius, brother Glen Surprenant (Virginia) and sister Lavonne Allen (Dave). Funeral services will be held at St. Isabel’s Catholic Church on Sanibel Island 11:00 AM Tuesday, August 14 with a gathering and celebration of her life at the Sanibel Community Center following the mass. In lieu of flowers, memorial donations may be made in Lenora’s name to Unbound, a catholic based charity located in Kansas City that provides financial support to families and individuals in disadvantaged countries. Lenora supported this charity for many years. She was also fond of the Cypress Cove Staff Scholarship Fund.